With Huge Fines, German Law Pushes Social Networks To Delete Abusive Posts : Parallels Social media companies could be penalized by as much as $58.3 million if they don't remove a malicious post from their platforms soon after it is reported — in some cases within 24 hours. 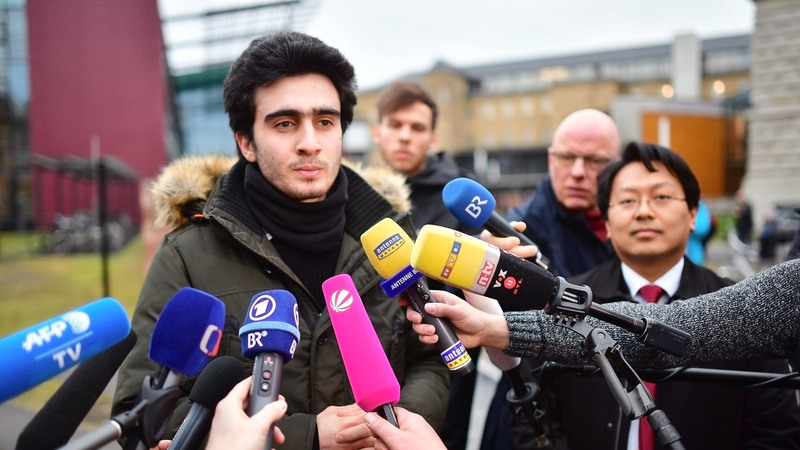 Anas Modamani speaks to the media Feb. 6 in Wuerzburg, Germany, after a court session about his lawsuit against Facebook. Modamani's suit, regarding the misuse of a selfie he took of himself with German Chancellor Angela Merkel was rejected, but his lawyer Lawyer Chan-Jo Jun, right, says that under a new law a lawsuit might not even have been necessary. Like the United States, Germany is grappling with fake news and hate speech and what to do about it. For decades, it has banned incitement, defamation, and phrases and symbols from the Nazi era. But the lines have been a lot murkier when the offenses in question are on the Internet. Chancellor Angela Merkel's governing coalition tried to address the discrepancy this year with a controversial "Network Enforcement Law," which the German parliament passed on June 30, and which quietly went into effect on Oct. 1. Under the measure — touted by many as the toughest law of its kind in the Western world — social media companies that have at least 2 million users in Germany, including Facebook, Google and Twitter, can be fined as much as 50 million euros ($58.3 million) if they fail to delete comments and posts that are deemed to violate German law. In clear-cut cases, the time that the platforms have to remove the offending material can be as little as 24 hours. Gerd Billen, state secretary at the German Justice Ministry, which is in charge of monitoring compliance with the new law, said there will be a grace period until at least Jan. 1 to give companies time to come up with plans and hire staff to implement the new law. German lawyer Chan-jo Jun said he believes the new law would have helped his client, Syrian refugee Anas Modamani. Last March, Modamani, 20, lost a high-profile case against Facebook, in which he wanted the company to stop users from reposting a selfie he had taken with German Chancellor Angela Merkel in 2015. The photo was being altered and used repeatedly in fake news stories on Facebook, falsely linking him to the deadly Christmas market attack last December in Berlin and the attempted murder a few days later of a homeless man. The Wuerzburg court ruled March 7 that Facebook wasn't responsible for the distribution or removal of the photo under German or European laws. The new law "would have made a difference for us," Jun said. "I think the trial would not have been necessary because under the network law, Facebook would have been obliged to delete the content in the first place." A complex effort for "critical influencers of public and private opinion"
Facebook declined to be interviewed, but said in an emailed statement: "We appreciate that this is a very difficult situation for Mr. Modamani. That is why we quickly disabled access to content that has been accurately reported to us by Mr. Modamani's legal representatives, and will continue to respond quickly to valid reports of the content at issue from Mr. Modamani's legal representatives." Some of the altered photos and false claims about Modamani are still visible on at least one account on Facebook. Facebook also said in the statement that it "shared the goal of the German government to fight hate-speech" and has made "substantial progress in removing illegal content." But it also noted that implementing the law would be complex. The company declined to say how many people it would hire to comply with the new German law. Billen estimated the number to be about 170-180 employees for Facebook, but said his ministry hasn't received planning or hiring details from Google or Twitter yet. The Justice Ministry is hiring 40 people, including prosecutors, psychologists and clerks, to review what the companies are doing and deal with what Billen estimates will be 25,000 to 30,000 complaints a year from German users. Not every nasty post or comment will be punishable under the new law, Billen said: "If one were to say 'the chancellor is stupid,' then it's not a nice or smart statement, but it's not punishable by law. But if one were to say: 'Mrs. Merkel on X day during her Berlin appearance should have her head cut off,' that could be considered a crime." Billen added the law is an important tool to bringing social media companies more in line with other media in terms of their responsibilities to the German public. "They are not just technology companies, but critical influencers of public and private opinion," he said. Relieving the symptoms, ignoring the disease? But many critics of the new law call it an assault on free speech that is more likely to increase censorship than to decrease fake news and hate speech. They predict the law will be challenged in court, and that the new German government could amend it as early as next year. Social media companies "should have some sort of regulation," said Volker Tripp, a lawyer and political managing director for the Berlin-based, non-profit consumer group called Digital Society. But he doesn't think the new law is it. "What it does is to put immense pressure on social networks by ordering them to come up with a legal evaluation of posts within a finite amount of time," he said. "Like they have to see within 24 hours whether a post is illegal or not. This just doesn't work." Nor does it get at the reasons why hate speech and fake news are growing in the first place, which has more to do with growing public mistrust in the German government's ability to address societal and economic issues, he said — including the impacts of globalization or the influx of more than a million migrants and asylum seekers in recent years. "Fake news, hate speech, bots ... they are just symptoms of a much deeper running problem," Tripp said.